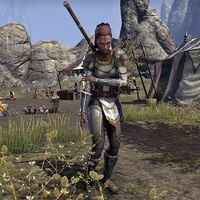 Abadi is a Redguard member of the Shornhelm City Guard protecting the refugees from Crestshade at Camp Tamrith. She is standing in Camp Tamrith, clearly wounded after the vampire attack. "Did Countess Tamrith give you a poultice for me? I could use a little something to dull this pain." Countess Tamrith asked me to give you this poultice. "Thank you. This will help my wounded arm. The vampires... they attacked without warning. We lost a lot of good people today." I need to find Captain Janeve. "I saw her briefly. She was in the thick of things, fighting beside the rest of us. Then she ran off, chasing a dark cloud toward the river. It must have been the Argonian necromancer. The Captain hates the dark arts and she can't wait to stop him." This page was last modified on 8 March 2019, at 19:11.